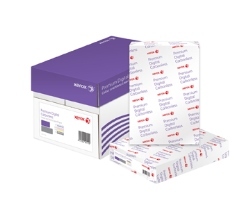 Xerox Premium Digital Carbonless Paper is a range of A4 premium NCR papers specifically designed for the production of high quality, short run business form sets on your mono or colour laser printer, digital press, or copier. • 2 parts precollated straight CB80/CF80 - White/Pink. • Precollated to save time. • 2 parts precollated straight CB80/CF80 - White/Yellow. • 3 parts precollated straight CB80/CFB80/CF80 - White/Yellow/Pink. • Precollated to save time. See Buying Guides to determine straight or reverse precollated. • 3 parts precollated reverse CF80/CFB80/CB80 - Pink/Yellow/White. • 4 parts precollated straight CB80/CFB80/CFB80/CF80 - White/Yellow/Pink/Blue. • 4 parts precollated reverse CF80/CFB80/CFB80/CB80 - Blue/Pink/Yellow/White. Pre-perforated vertically (10mm from edge).